Capsicum annuum is a species of the plant genus Capsicum (peppers) native to southern North America and northern South America. This species is the most common and extensively cultivated of the five domesticated capsicums. The species encompasses a wide variety of shapes and sizes of peppers, both mild and hot, such as bell peppers, jalapeños, New Mexico chile, and cayenne peppers. Cultivars descended from the wild American bird pepper are still found in warmer regions of the Americas. In the past, some woody forms of this species have been called C. frutescens, but the features that were used to distinguish those forms appear in many populations of C. annuum and are not consistently recognizable features in C. frutescens species. Moreover, crosses between C. annuum and C. frutescens aren't likely because seeds obtained from pollination between those two species (if the embryo survives) will not germinate. Capsicum annuum 'Medusa', a mild ornamental cultivar. Although the species name annuum means “annual” (from the Latin annus “year”), the plant is not an annual but is frost tender. In the absence of winter frosts it can survive several seasons and grow into a large, shrubby perennial herb. The single flowers are an off-white (sometimes purplish) color while the stem is densely branched and up to 60 cm (24 in) tall. The fruit are berries that may be green, yellow, orange or red when ripe. While the species can tolerate most frost-free climates, C. annuum is especially productive in warm and dry climates. While generally self-pollinating, insect visitation is known to increase the fruit size and speed of ripening, as well as ensuring symmetrical development. Pepper flowers have nectaries at the base of the corolla, which helps to attract pollinators. The anthers do not release pollen except via buzz pollination, such as provided by bumble bees. The species is a source of popular sweet peppers and hot chilis with numerous varieties cultivated all around the world, and is the source of popular spices such as cayenne, chili, and paprika powders. Common naming in English falls generally in line with the flavor and size of the variant. Larger, sweeter variants are called "capsicums" in Australia and New Zealand and red or green peppers, or "bell peppers" in the United States and Great Britain. The smaller, hotter varieties are called chillis, chilies, chile, or chili peppers, or in parts of the US, "peppers". Capsinoid chemicals provide the distinctive tastes in C. annuum variants. In particular, capsaicin creates a burning sensation ("hotness"), which in extreme cases can last for several hours after ingestion. A measurement called the Scoville scale has been created to describe the hotness of peppers and other foods. Some cultivars grown specifically for their aesthetic value include the U.S. National Arboretum's 'Black Pearl' and the 'Bolivian Rainbow'. Ornamental varieties tend to have unusually colored fruit and foliage with colors such as black and purple being notable. All are edible, and most (like 'Royal Black') are hot. The potato tuber moth (Phthorimaea operculella) is an oligophagous insect that prefers to feed on plants of the family Solanaceae such as bell pepper plants. Female P. operculella use the leaves to lay their eggs and the hatched larvae will eat away at the mesophyll of the leaf. Typical C. annuum flower, Royal Embers. Bolivian Rainbow with its fruits in different stages of ripeness. 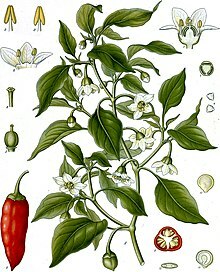 Wikimedia Commons has media related to Capsicum annuum. ^ a b "Capsicum annuum". Germplasm Resources Information Network (GRIN). Agricultural Research Service (ARS), United States Department of Agriculture (USDA). Retrieved 2010-07-29. ^ Latham, Elizabeth (2009-02-03). "The colourful world of chillies". Stuff.co.nz. Retrieved 2009-03-08. ^ Francis, John K. (2003-09-09). "Capsicum annuum L. bird pepper - USDA Forest Service" (PDF). Retrieved 2013-09-30. ^ Zhi-Yun Zhang, Anmin Lu & William G. D'Arcy. "Capsicum annuum Linnaeus, Sp. Pl. 1: 188. 1753". Flora of China. 17. pp. 313–313. ^ Carlos Eduardo da Silva Monteiro; Telma Nair Santana Pereira; Karina Pereira de Campos (2011). "Reproductive characterization of interspecific hybrids among Capsicum species" (PDF). Crop Breeding and Applied Biotechnology. Brazilian Society of Plant Breeding. 11: 241–249. ^ "Peppers and chillies". Royal Horticultural Society. Retrieved 21 Dec 2017. ^ Katzer, Gernot (May 27, 2008). "Paprika (Capsicum annuum L.)". Retrieved December 1, 2012. ^ Organisation for Economic Co-operation and Development (1 July 2006). Safety assessment of transgenic organisms: OECD consensus documents. OECD Publishing. pp. 299–. ISBN 978-92-64-02258-4. Retrieved 25 November 2011. ^ "Food glossary – Pepper". Waitrose. ^ "Tesco Red Peppers". TESCO. ^ "Morrisons Loose Green Pepper". Morrisons. ^ "Food glossary – Chilli". Waitrose. ^ Lindley, John (1838). Flora Medica, page 509. ^ "Capsicum annuum "Black Pearl"" (PDF). U.S. National Arboretum. March 2006. Retrieved February 21, 2011. Malgorzata, Materska (March 2015). "Flavone C-glycosides from Capsicum annuum L.: relationships between antioxidant activity and lipophilicity". 240 (3): 549–557. doi:10.1007/s00217-014-2353-2. Arimboor, Ranjith; Natarajan, Ramesh Babu; Menon, K. Ramakrishna; Chandrasekhar, Lekshmi. P; Moorkoth, Vidya (March 2015). "Red pepper (Capsicum annuum) carotenoids as a source of natural food colors: analysis and stability-a review". Journal of Food Science and Technology. 52 (3): 1258–1271. doi:10.1007/s13197-014-1260-7. PMC 4348314.